The three of them would have never met except for the whims, superstitions of a vengeful, possibly deranged woman. 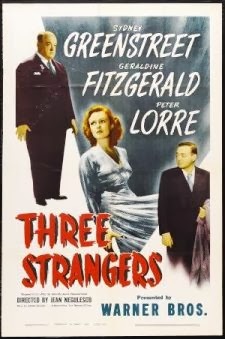 The woman is Crystal Shackelford(Geraldine Fitzgerald) and she picks up two men randomly, seperately, on Chinese New Year, and convinces them to go along with her plam. Peter Lorre is Johnny West, a small time hood and drunk, and Sydney Greenstreet is Jerome K. Arbutny. a lawyer. Mrs. Shackelford has a bronze idol of Kwan Yin and the legend is on midnight of Chinese New Year, her eyes will open and bestow a grant on three strangers. The three must remain strangers until after midnight. Johnny has a lottery ticket he bought for ten shillings and the three agree to split cost and benefits and any winnings to go the big race. All sign without the other seeing the names. Midnight comes, the lights are blown out, and the lady swears she saw the eyes open just before that. The three go their separate ways. All are soon beset by problems. Mrs. Shackelford wants her husband back, always when she doesn’t have him, but he’s found a new love in Canada and wants a divorce. Johnny West is roped into a murder conviction by a lying man and doesn’t defend himself. “What point? No one will believe me.” He’s scheduled to hang.. Arbutny is about to be ruined, He has been in charge of a rich widow’s estate and invested in some bad stocks. An auditor is about to go over the books. The lottery ticket wins of course, but the race is yet to come. Only one of the three comes out of it okay. 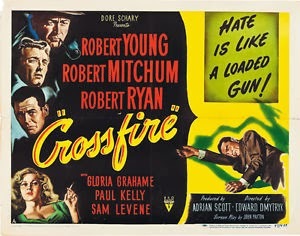 CROSSFIRE starred three Roberts: Young, Mitchum, and Ryan in a crime drama about the search for a killer. 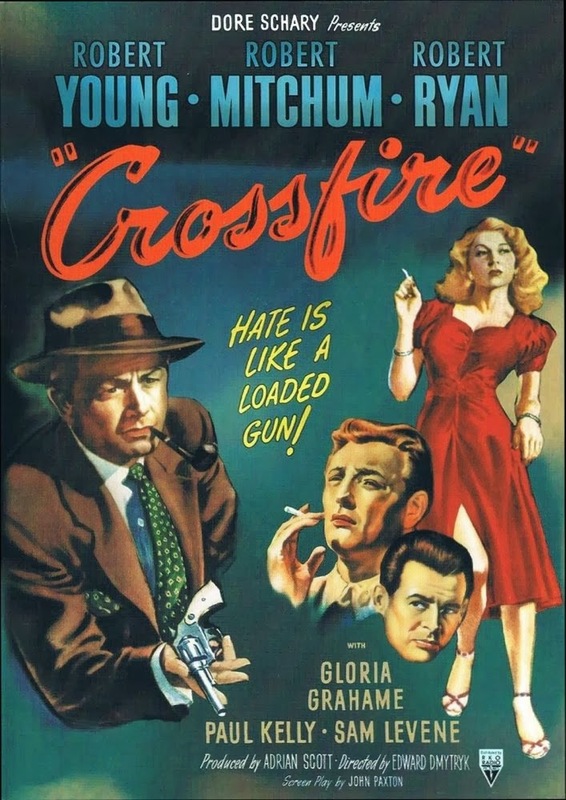 Robert Young, years before Father Knows best, is Captain Finlay, the cop investigating the murder. Robert Mitchum is Sgt. Peter Keeley, army and Robert Ryan is Montgomery, part of a recently discharged army unit. the army in their infinite wisdom made a sign painter. He’s unhappy and mixed up. The night it all goes down Keeley had sent for Mitchell’s wife to come down and cheer him up. With that in mind, he was determined to keep the young man sober. Things don’t go as planned and the murder happens. Mitchell has disappeared and Finlay is looking for him. Keeley is certain his young friend didn’t do it and is working to prove that. 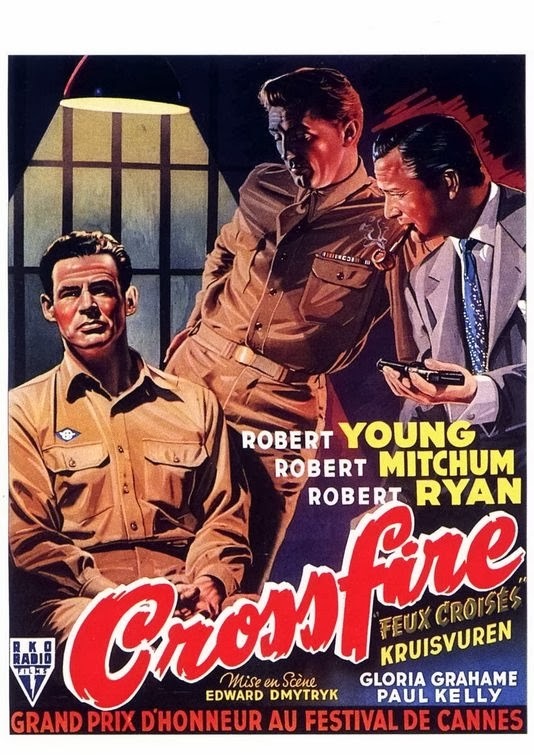 CROSSFIRE was the first B picture to be nominated for best picture, actually accruing five Oscar nominations, including Robert Ryan and Gloria Grahame as best supporting actors. Grahame was a young woman that gave Mitchell a partial alibi, at least setting Finlay off in a different direction. The film is about the dangers of hate for no reason, in this case a theme of anti-Semitism. For more overlooked movies and related matters, check in at SWEET FREEDOM on Tuesdays. BROTHER ORCHID tells the story of a hood that wanted to go straight and get “class.” He finds it’s not that easy and then learns the true meaning of class and how to get it. 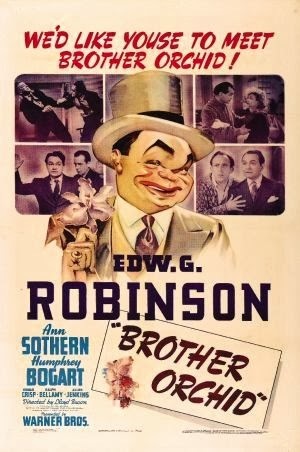 Edward G. Robinson is “Little John” Sarto, boss in one of New York’s biggest mobs. He announces one day that he’s retiring from the mob and going to Europe to get some class. He turns the mob over to his pal and lieutenant Jack Buck(Humphrey Bogart). This was just before Bogart’s star began it’s rise and he only got third billing behind Ann Sothern who plays Flo Addams, Johnny’s girl. Flo is disappointed when John Sarto, businessman and sportsman, tells her she’s not going. There will be a big wedding when he gets back. To appease her, he tells her he will get her in at a big night club. Some “in.” She’s the new hatcheck girl. Though a big deal in gangland circles in New York, John Sarto in Europe is seen as a sucker and we get a montage of him buying expensive toys that turn out to be fakes: the biggest diamond in the world that’s really a glass doorknob, a race horse that he ends up selling for a hundredth what he paid. After five years, the money is gone and he decides to come home and take his old job back. Jack Buck laughs in his face and tosses him out. He finds that Flo has moved up in the world. She now owns the club he got her the hatcheck job, courtesy of a loan from a rich Montana rancher named Clarence Fletcher(Ralph Bellamy). Deciding to fight back, Little John gathers a new mob with tha aid of the only man still loyal to him, Willie The Knife(Allen Jenkins). out near a monastery and is taken in. The group nurse him back to health and he joins them, figuring to use them for a hideout. But he’s gradually won over by the brothers simple life. They raise flowers, sell them in the city, and any profits go to the poor. They care nothing about a man’s past, don’t need to know a name. 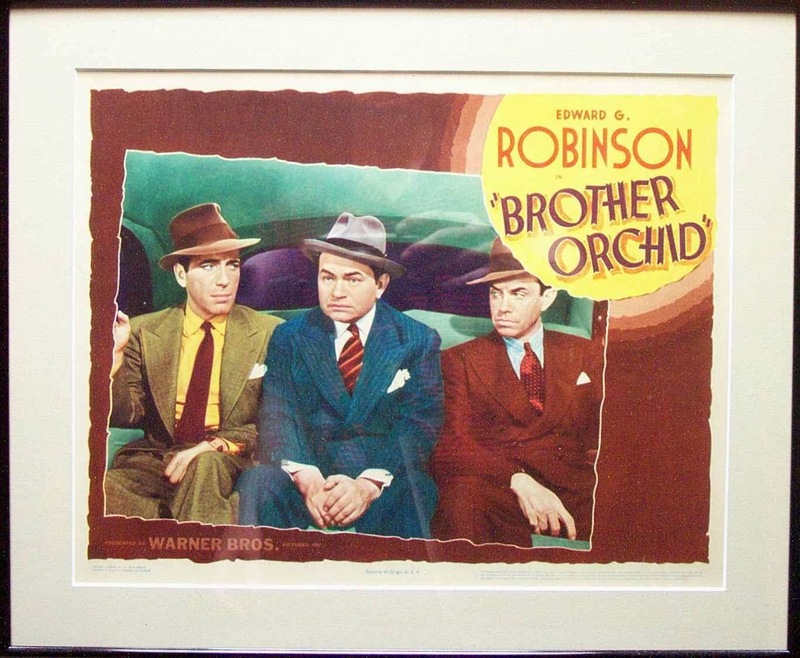 Little John Sarto becomes Brother Orchid. John has never seen people like them. After several months and a few screw-ups, “a guy can’t change all at once, see”, he decides to leave when he sees Flo is marrying her rich rancher. 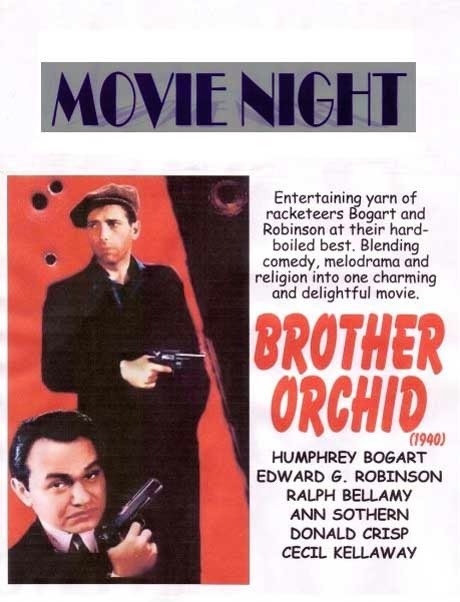 One final confrontation with Buck and the mob makes Brother Orchid realize where his heart really is these days. A bit of an unusual film. For more overlooked movies and other related stuff, Todd Mason gathers them on Tuesdays over at SWEET FREEDOM. 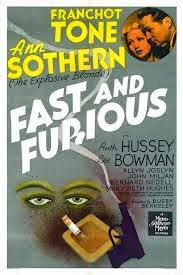 The 1939 FAST AND FURIOUS was the third film of the crime solving husband and wife team of Joel and Garda Sloane. Oddly, each film featured different actors playing the roles. Here, Franchot Tone and Ann Sothern play the parts. Busby Berkeley directed. Joel Sloane is a book dealer and Garda works as his secretary. In the film, it’s a hot summer and she’s scheming to get them away for the weekend to a cooler place. When old friend Mike Stevens drops by the office and hits him up for a five thousand dollar loan, to go with his matching funds on a business investment, Sloane succumbs when he learns it’s a beauty pageant on the ocean in Jersey. Unknown to him, he’s made one of the judges. Garda is a jealous woman sometimes and is suspicious when they get there, laying down the law. Sloane promises but keeps finding himself in the midst of beautiful women and gets pulled in. other entries in the series. The show promoter, and the one Mike had invested the ten grand with, is about to be indicted and word has slipped that he’s skipping with the pageant funds, taking one of the contestants with him. He gets murdered when Mike rushes up to get his money back and gets hung with the charge. It’s up to Joel and Garda to find the real killer, what happened to the money, and then the killer of one of the contestants. And we won’t even mention the three lions in the Sloane bedroom. Todd Mason does the gathering as always on Tuesdays over at Sweet Freedom.